Capt. John Stafford Rhodes, a well-known pioneer resident of Fort Recovery, whose portrait is shown on on the left, he, was born October 2. 1826, in Caledonia County, Vermont, and is a son of Josiah K. and Mary (Brown) Rhodes. Not only has Captain Rhodes won military rank and reputation for himself, but he also comes of Revolutionary stock. His father was a son of Oliver and Martha (Pratt) Rhodes, the former of English and the latter of French extraction. Grandfather Oliver Rhodes was a gallant soldier in the Patriot army all through the Revolutionary War, serving for six years under General Washington and winning deserved promotion. Josiah K. Rhodes was reared and educated in Vermont and in young manhood learned the trade of house-joiner. In 1835 he removed with his family to Cuyahoga County, Ohio, where he remained two years and then moved to Licking County. During his residence in the former county, he completed the erection of the first Presbyterian Church ever built at Strongs- ville, which is still standing. The family continued to live in Licking County until 1861, when Josiah K. Rhodes and wife and their son, Robert b: Rhodes, removed to Van Wert County and settled at Willshire. 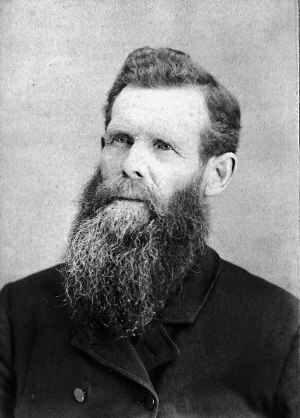 There Josiah K. Rhodes died in November, 1892, aged 92 years. Josiah K. Rhodes was united in marriage with Mary Brown, who was -born near Belfast, Ireland, in 1795, and was a daughter of Stafford Brown, who was adjudged an Irish rebel in 1798. The English confiscated his prop- erty and he and his family escaped to America and settled in Vermont. Mrs. Rhodes was the eldest of three children. One brother died and was buried at sea. The other brother became a resident of Vermont. Josiah K. Rhodes and wife had two sons and two daughters, namely: John Stafford, of this sketch; Robert B., who died at Willshire, Ohio, August 26, 1901; Mary Ann, who married Paschal Horton and died in Licking County, Ohio; and Martha, who resides in Delaware County, Ohio. From boyhood the subject of this biography was of a more adventurous spirit than are most youths. Perhaps the blood of his maternal grandfather, the Irish patriot and of his paternal grandfather, the Revolutionary soldier, flowed hotly through his veins. Be this as it may, he did not feel satisfied with the ordinary life of a boy of 16 in his circumstances and surroundings, and was but four days older than this when he took his future in his own hands and ran away from home. He found his way to Mercer County, Ohio, where there was work for all, and worked at his trade during the summer. In the fall he went on the Ohio River as a hand on a flatboat running out of Portsmouth, Cincinnati and lower points. He made 21 trips to New Orleans and return. At first his wages were $15 per month, but when he closed out his contract with his employers, he was receiving $75 per month as second pilot. Captain Rhodes landed first at Fort Recovery on April 12, 1844, and during his flatboat experience he lived at this place, working during the summers as a house-joiner. When he became a resident here, there were but five families in the hamlet. Henry Lipps kept the first hotel, a log structure, and our subject was one of his boarders. The little eight-year-old daughter playing around at that time later became the wife of Captain Rhodes. Until 1854 he continued running on the boats up and down the Ohio and Mississippi rivers, but after his marriage he engaged in farming. He purchased ioo^4 acres of farm land, which was the last piece of canal land entered in Mercer County, the transaction having been carried out by Henry Lipps. For this land Captain Rhodes paid the sum of $960. At that time it was wholly in its natural, wild state, without any improvementss. He still makes his home here, having owned the property since November, 1859, and it is still intact, with the exception of a few acres which the Lake Erie and Western Railroad have taken off. In the fall of 1865 he bought 6j4 acres directly across the road, in Gibson township, for which he paid $40 per acre. His residence thus stands in Recovery township and his barn in Gibson township. Captain Rhodes enjoyed but a few years of quiet, agricultural life after settling on his farm, for, as soon as the Civil War broke out, he began to make preparations to take an active part in it. On August 16, 1862, he enlisted as a private, in Company C, n8th Reg., Ohio Vol. Inf.^contracting to serve for three years. At the organization of the company, he was elected 2nd lieutenant, on December 15, 1862, he was promoted to be ist lieutenant, and on April n, 1864, was promoted to the captaincy of Company C, n8th Reg., Ohio Vol. Inf. After a hazardous service of three years, during which time he experienced every hardship of a soldier's life except wounds, he was mustered out at Salisbury, North Carolina, June 24, 1865, and honorably discharged at Cleveland, Ohio, July 12, 1865. It would be almost impossible to follow, in a work of this kind, the actual events of Captain Rhodes' military career, as they were too numerous, and we content ourselves with giving merely an outline. He participated in the battles of Kingston, Tennessee, and Mossy Creek, Tennessee, and was all through the famous Atlanta campaign, during which time his regiment was under continuous fire for four months. This campaign included the battles of Dai- ton, Buzzard's Roost, Kenesaw Mountain, Resaca, Dallas, Pumpkin Vine Creek, all the battles near Atlanta and the great battle at Atlanta, July 22 and 28, 1864. He participated also in the hard-fought battles of Franklin and Nashville, after which his regiment followed Hood's demoralized army as far back as Clifton on its retreat southward. The regiment then went by rail and steamer to Washington, then to Fortress Monroe and Smithville, North Carolina, and marched up Cape Fear River to Fort Anderson and assisted in the capture of the same. This regiment was on the skirmish line and was the first to go over the fortifications and reach the flag on the fort. They seized and waved the colors to the river fleet steaming up the river. This regiment participated also in the capture of Wilmington, North Carolina, on February 22, 1865, firing a salute of 100 guns to celebrate this victory gained on Washington's birthday. On March 8, 1865, the regiment made a forced march to Kingston, North Carolina, wading through swamps for five days, the water being sometimes as high as the soldiers' hips, assisted in the capture of Goldsboro, and later joined Sherman's army. Captain Rhodes passed through all the hardships of the subsequent campaign and never suffered from a wound of any kind and was sick but for a short season. He was captured twice in one day by the same division of Wheeler's cavalry, but was not held on either occasion longer than sufficed for his captors to rob him of everything they could carry off. He is the only commissioned officer who left Mercer County and returned with the same company. At different times he "commanded every company in his regiment except Company E.
Upon his return to Fort Recovery from the army, Captain Rhodes completed the house which he had begun in 1861. He has been a continuous and honored resident of Recovery township ever since and has been active in the management of the public affairs of the community for many years. For 17 years he served as one of the councilmen of Fort Recovery and for an extended period has served in a highly satisfactory manner as township clerk and as a justice of the peace. On November 20, 1855, Captain Rhodes was married at Fort Recovery to Sarah Jane Lipps, a daughter of Hon. Henry Lipps, a pioneer here and a representative in the State Legislature in 1849-50. Mrs. Rhodes was born at Fort Recovery, Ohio, in 1836. To this marriage three children were born, namely: Jane Ann, who lives at home; Mary E., now a resident of Los Angeles, California, who is the widow of James A. Scott and the mother of one child; and Estella, who is the widow of Guilke Wallingsford, killed in a railway accident in 1901—she has one son, Leo. Captain Rhodes is one of the leading men in the Grand Army of the Republic in this section of Ohio. He joined the organization at Union City, Indiana, in 1867, and has the distinction of being the oldest Grand Army man in Mercer County. He was mustering officer of this district for several years and instituted the posts at Rockford and Middlepoint, and was the first commander of Harrod-McDaniel Post, No. 181, at Fort Recovery. He is also an Odd Fellow and a Mason, and was the first worshipful master elected by Fort Recovery Lodge, No. 539, F. and A. M.
Our subject relates an interesting incident of the days of 1851, when he was still a young man. With David J. Roop, one day early in July, he was searching for bullets on the old battle-field where General St. Clair met defeat, and accidentally found one of the pits in which the bodies of the victims of the terrible slaughter on that fatal 4th of November, 1/91, had been buried. The remains were re-interred on September 10, 1851, being buried in 13 black walnut coffins, made by Mr. Rhodes and Robert G. Blake. The ceremonies of that day made it Mercer County's greatest day of the I9th century. Fully 5,000 people were present, coming from many of the counties of Western Ohio and Eastern Indiana, to pay a tribute of respect to the fallen heroes. Judge Bellamy Storer rode all the way from Cincinnati to Fort Recovery, on horseback, a journey of five days, in order to deliver the funeral oration. It seems almost unnecessary to add that Captain Rhodes is a man of whom Mercer County is proud. His long and eventful life has served to prove his mettle as a man and to show to his fellow-citizens the fruits of patriotism, courage, industry and fidelity to duty.